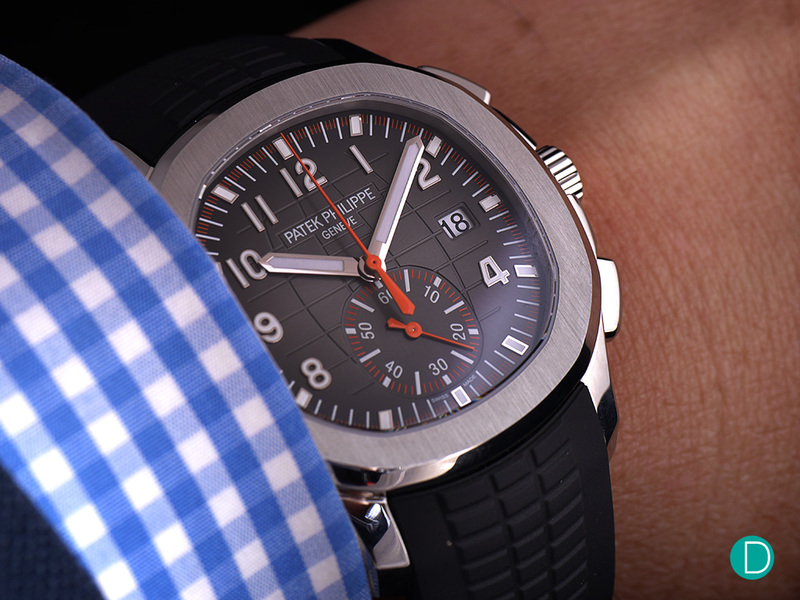 The utilitarian chronograph complication goes hand-in-hand with the sports watch. As such, it is perhaps not so much a surprise than it is an expectation that Patek Philippe’s sportiest line should receive a chronograph model sooner rather than later. First introduced in 1997, the Aquanaut was marketed as the sportier, hipper, less expensive version of the cult favourite Nautilus. This year, the illustrious Genevan manufacturer has finally released its first chronograph Aquanaut. 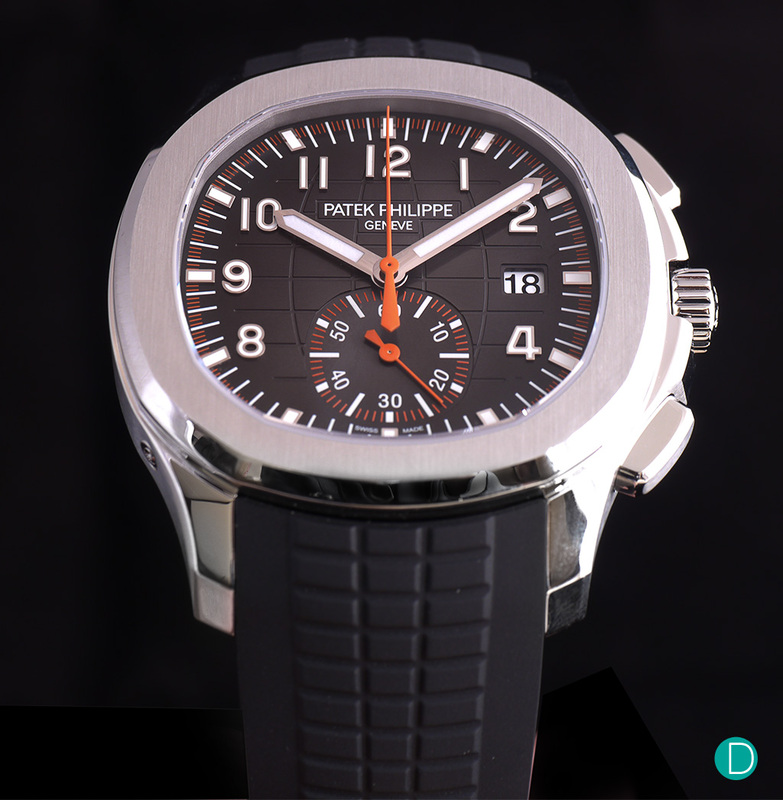 Here, we bring you the details and our thoughts on the new Patek Philippe Ref. 5968A. At 42.2 mm in diameter (measured from 10 to 4 o’clock), the stainless steel case of the Aquanaut Chronograph is neither dainty nor overbearing. Its 11.9 mm height might be thicker than what we’re used to seeing from Patek Philippe, but for a sporty automatic chronograph, it’s completely fine. Apart from the addition of two subtly nuanced and variably finished pushers at 2 and 4 o’clock, the case design remains unchanged, retaining the iconic porthole shape of the watch. 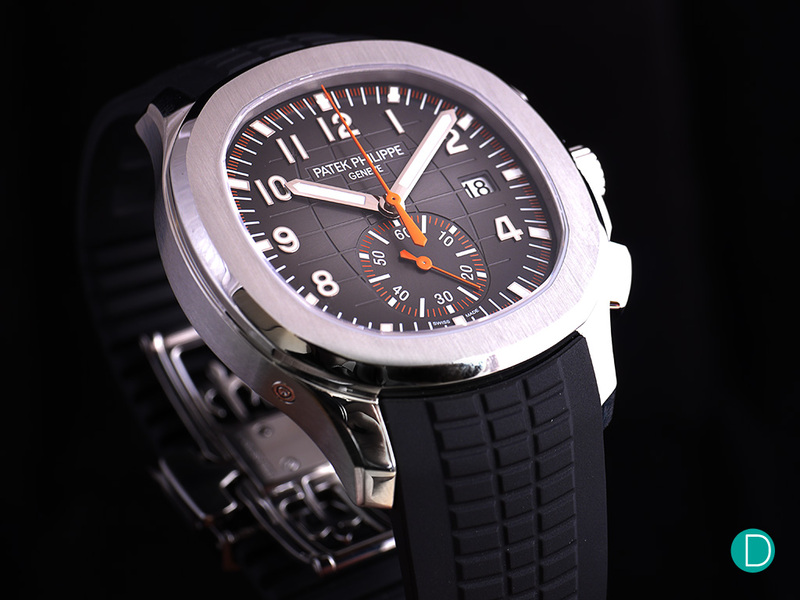 The case of the Aquanaut Chronograph remains largely unchanged. The only additions to it are the two elongated pushers that are integrated on both sides of the crown protector. The brass dial of the Aquanaut Chronograph is still the same deal with its embossed checkered pattern and sunburst finish. While Patek Philippe did release two blue-dialled models last year in conjunction with the line’s 20th anniversary, the brand has reverted to the standard black dial for this year’s Aquanaut novelty. The most notable change found on the dial of the new Aquanaut Chronograph is the addition of a chronograph minute counter, thoughtfully designed to be shaped like the case/bezel for consistency. Excellent legibility is guaranteed by the white gold applied Arabic numerals and broad baton hands – all with luminous coating. Apart from that, there’s of course the signal orange accents found throughout the dial, more specifically on the chronograph seconds and minute indices, and the lancet chronograph seconds and minute hands. 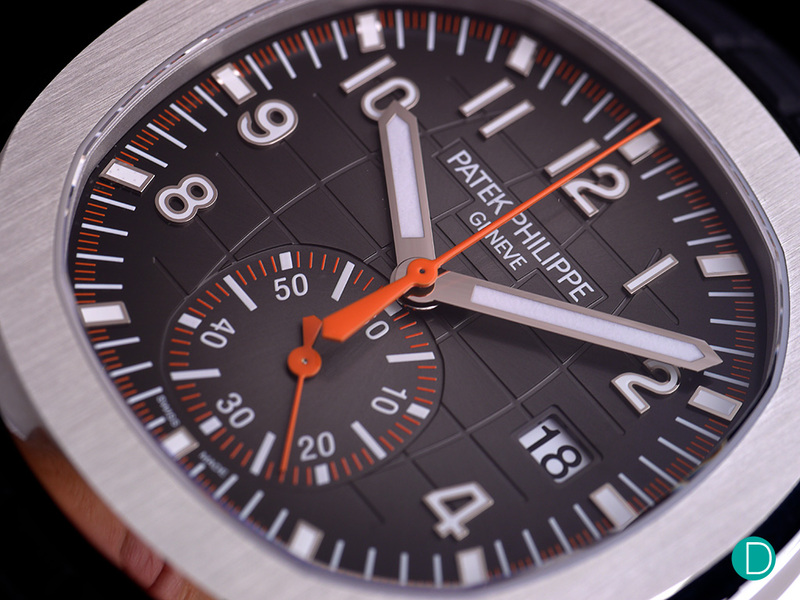 The use of the colour orange on a Patek Philippe timepiece is indeed unconventional, but you can bet your bottom dollar that this design decision was geared towards attracting a younger clientele. It may take some getting used to, but ultimately we think it works. The orange colour contrasts well against the black dial, improving legibility, and injects some youthfulness into what is after all Patek’s most casual timepiece. Powering the Aquanaut Chronograph is the 308-part, 32-jewel Calibre CH 28-520 C. The self-winding movement has 55 hours of power reserve (with the chronograph disengaged) and operates at a modern 4 Hz beat rate. It is worth noting that this is the exact same movement used in the Patek Philippe Nautilus Chronograph Ref. 5980 – and that’s okay. It wouldn’t make much sense anyway to design and build an entirely new chronograph movement for a watch from an ‘entry-level line’ when you already have several fantastic ones serving in the likes of the Ref. 5980 or Ref. 5170. 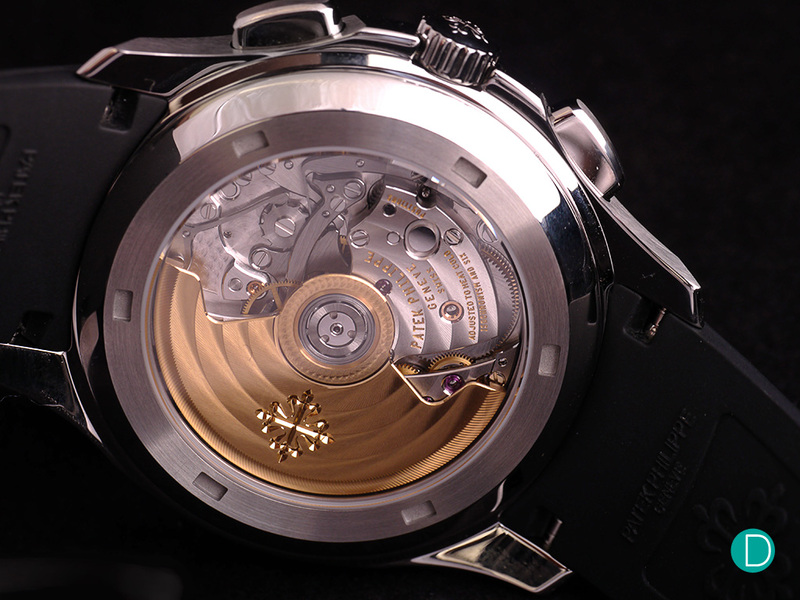 Case back view of the Calibre CH 28-520 C.
The Calibre CH 28-520 C is a column wheel/vertical clutch chronograph movement with flyback functionality. Because the clutch is virtually friction-free, the central chronograph hand can also be used as a continuously running seconds hand without introducing additional wear and tear. While not a perfect substitute, it does eliminate the need for a seconds sub-dial, allowing for a cleaner, more legible dial. It goes without saying that the movement is beautifully finished in accordance to the standards of the prestigious Patek Philippe Seal. Easily visible through the case back are the circular Côtes de Genève on the bridges and 21k gold central rotor, polished bevels, mirror polished screw heads and perlage on the main plate. The market for simple chronograph sports watches is crowded and highly competitive. The Aquanaut Chronograph positions itself at the upper end of the price scale at SGD57,700 or CHF38,600. Patek Philippe delivers the watch with two abrasion and UV-resistant composite straps: the black one is standard issue and can be replaced with the orange strap that amplifies the bold accents of the dial. It also comes with the manufacture’s newly designed fold-over clasp which has four independent catches. 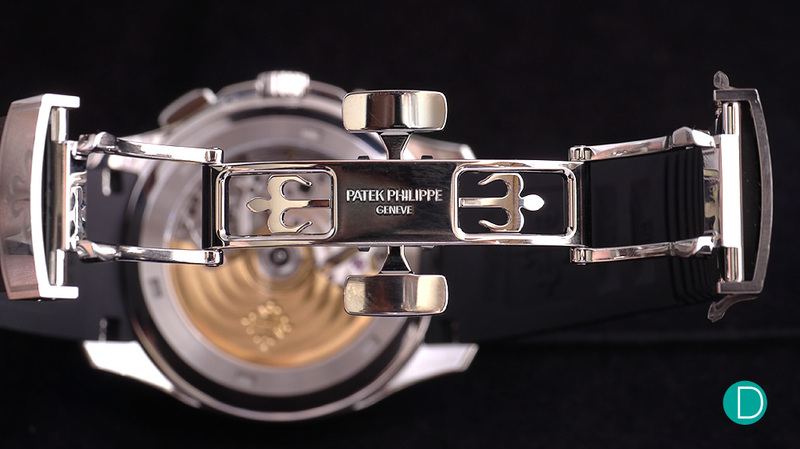 Patek Philippe innovation extends to its clasps too for improved functionality. Being the flagship sports watch of the brand, the Overseas by Vacheron Constantin is perhaps better compared to another flagship sports watch, like the Nautilus in the case of Patek Philippe. That said, we feel that it can also be compared alongside the Aquanaut Chronograph. The Vacheron Constantin Overseas Chronograph comes with a rubber strap like the Aquanaut, as well as a metal bracelet and a leather strap. It is powered by the Calibre 5200, which is also a column wheel/vertical clutch automatic movement and equally well finished. In addition, the Overseas Chronograph is priced similarly to the Aquanaut Chronograph at EUR31,100 or CHF37,260. But while it is marginally thicker, we do feel that the Overseas has a slight edge in aesthetics and practicality (three straps to cover all occasions, greater water resistance albeit at the expense of having annoying screw-down pushers, anti-magnetic protection). Furthermore, its lack of a flyback function is made up for by its ability to time events for up to 12 hours. Based solely on these metrics, the Overseas appears to provide more watch per dollar compared to the Aquanaut. 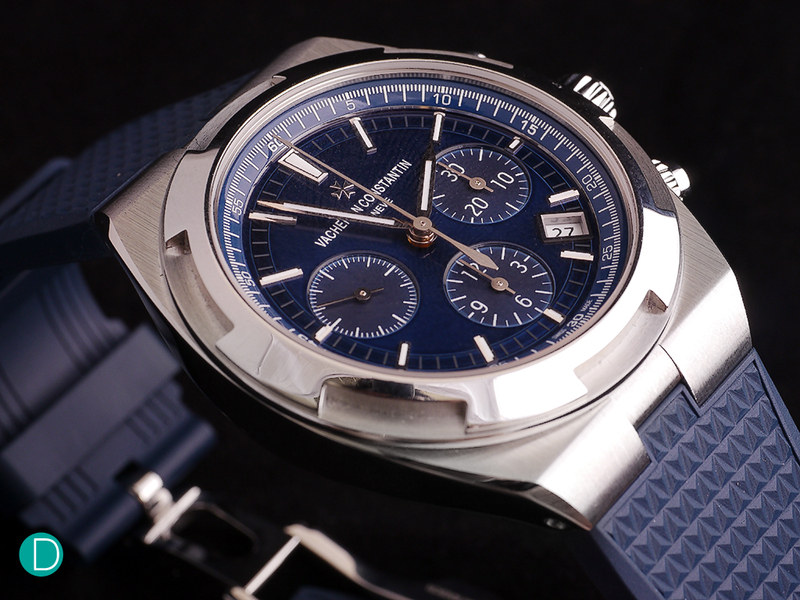 The Vacheron Constantin Overseas Chronograph with its luscious blue dial and signature Maltese cross bezel. 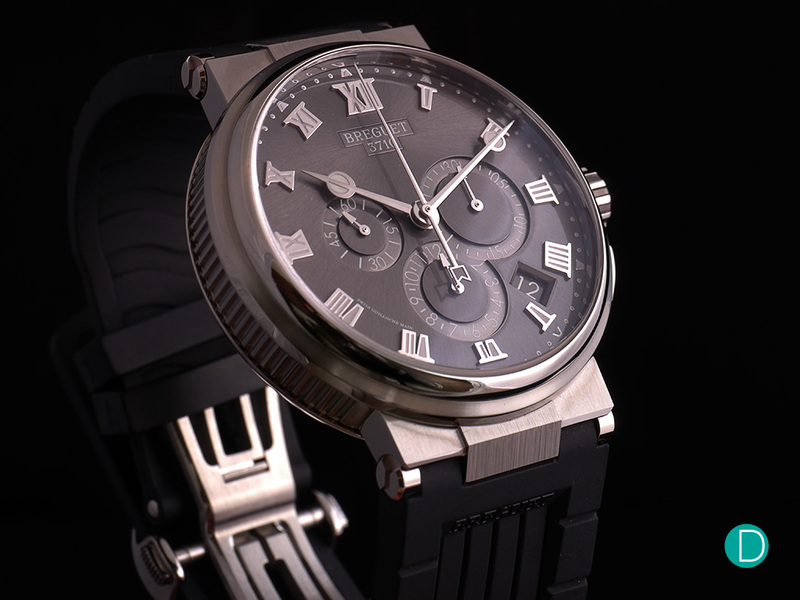 Perched on a lower rung of the pricing ladder is the Breguet Marine Chronograph Ref. 5527, redesigned and presented at Baselworld 2018 with a price tag of USD22,600 or CHF21,800 for the titanium variant. The watch is an automatic, 12-hour chronograph with a date function not unlike the Overseas Chronograph. It is arguably more outgoing in design than the Aquanaut, with a subtly marine-themed dial and the brand’s signature fluted case band. Even the central rotor of the Calibre 582QA that powers the watch resembles a ship’s wheel – very fitting indeed. All that said, the movement does lack the quality of finish that has been afforded to the Aquanaut’s Calibre CH 28-520 C. Without a doubt, the more meticulous finishing applied to the Calibre CH 28-520 C would have contributed to the Patek’s dearer pricing; whether or not that price premium is worth stomaching depends on individual biases. The Breguet Marine Chronograph comes in many versions; this one is the sportiest with its grey sunburst dial and titanium casing.